After a year and a half of neglect, I’ve decided to open source DeliciousSafari and the Bookmarks iPhone app in the hope others will continue to improve them. 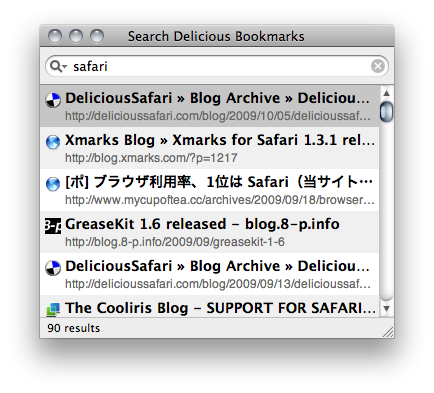 Search has finally been added to DeliciousSafari in version 1.9. You can now search your bookmarks by tag or title. This release also includes minor bug fixes. Version 1.8 of DeliciousSafari is available. Feature wise, this release is identical to 1.7 except that it also works on Snow Leopard.